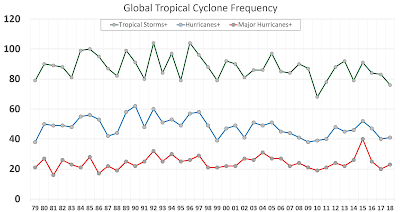 MSE Creative Consulting Blog: What Is the Trend (If Any) In Hurricane Numbers and Intensities? 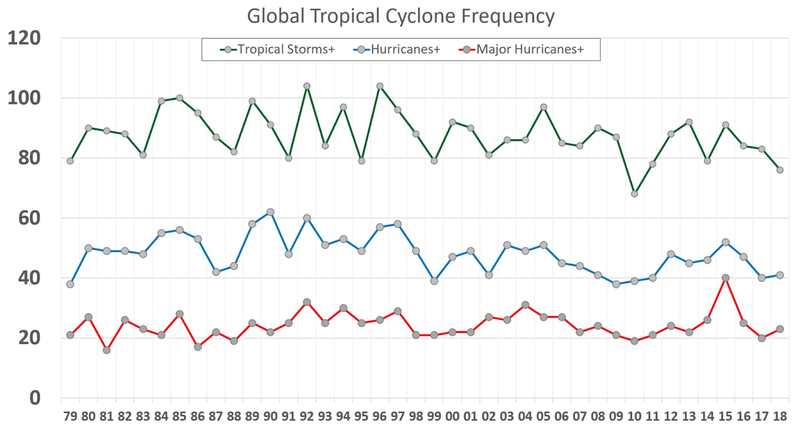 What Is the Trend (If Any) In Hurricane Numbers and Intensities? Below is an recommended article from the Wall Street Journal pertaining to the skyrocketing losses due to hurricanes. That is primarily due to more people and "stuff" put in harm's way. What about the trends, if any, in the hurricanes themselves? Dr. Ryan Maue, a PhD in tropical meteorology, updated the figures today. Since 1979, we've had worldwide weather satellite coverage (although the quality wasn't as good the first few years as it is now), so we can make some inferences by looking at those numbers (valid through yesterday). There are slight downward trends in both tropical storms and hurricanes, meaning they are becoming slightly less frequent. There does seem to be a slight upward trend in number of major hurricanes. This does fit a part of the global warming hypothesis. The above graph shows all hurricanes and major hurricanes with the trend lines. 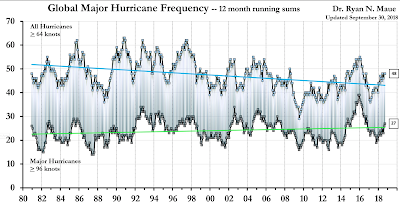 So far, while more years of data are needed, this does seem to support the hypothesis of some climate scientists that hurricanes, given a warming atmosphere, will be less frequent but of higher intensity.